Welcome to April at Block Lotto. Let’s use up some scraps! Our April Block Lotto block is the traditional Noon and Light pattern. In keeping with springtime, find a yellow in your stash or scraps that you can use in this block as your background. You’ll need around a fat eighth. The rest of the pieces will be scraps – colors your choice. The finished blocks measures 9” – or 9 ½” unfinished. Here is the link for the PDF file: Scrappy Noon and Light. There you will find the assembly instructions. Any Questions? Please email me: anudge (at) gmail(dot)com Look forward to seeing your blocks. 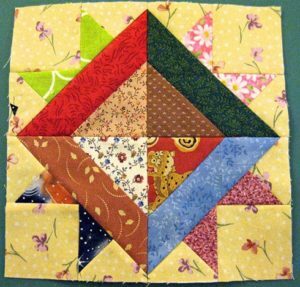 Oh, a great scrappy pattern, right up my alley, and I just made a couple of quilts with yellow, so I think I can do this! Angie, this is a great block!